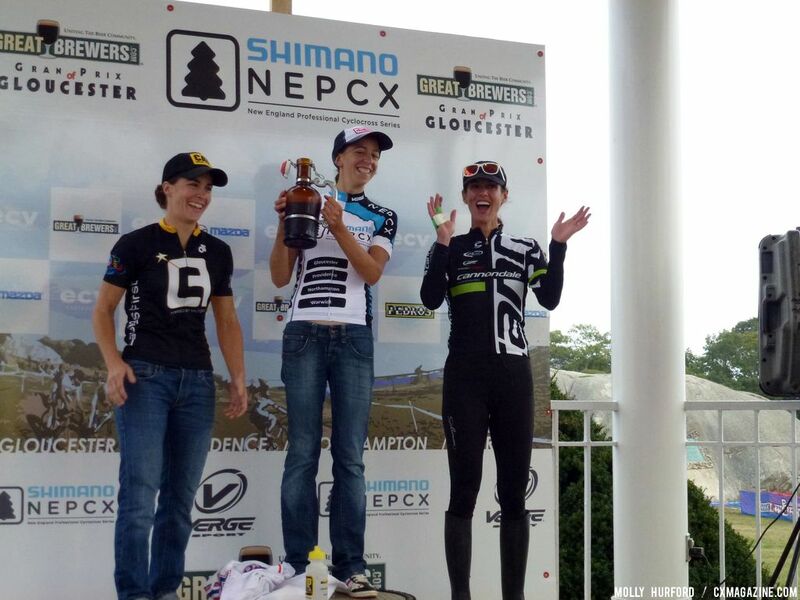 Smith, Wyman and Duke on the Women's Podium at Gloucester Day 1. Helen Wyman (Kona) rode a patient race, watching Nicole Duke (Cannondale p/b CyclocrossWorld) play the aggressor early on in the 2011 Gran Prix of Gloucester. Andrea Smith (Ladies First Racing) and Wyman took turns chasing Duke, and once the connection was made, it was just a matter of time before Wyman took off and add yet another win to her already successful American campaign. Smith followed for second, with Duke in third. The Elite Women had an extremely deep and talented field toeing the line, hoping to pull on the first-ever Shimano Series jersey. 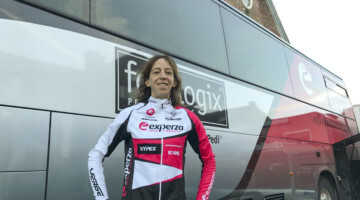 A torrid pace was set from the gun with British Champion Helen Wyman (Kona/FSA Factory Team) taking the holeshot and her compatriot Gabby Day (Renner Custom Cyclocross) taking over the lead as the women headed towards the sea wall. 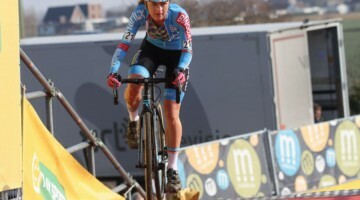 When they returned to the venue, Nicole Duke (Cannondale p/b cyclocrossworld.com) had taken to the front and put a few bike lengths behind her. 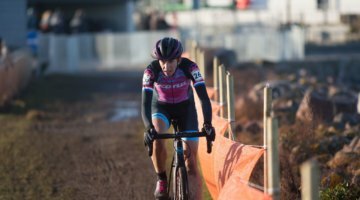 Behind, Wyman had taken up the chase ahead of Day, LadiesFirst Racing teammates Andrea Smith and Crystal Anthony, Duke’s teammate and US U-23 women’s champion Kaitlin Antonneau and Laura Van Gilder (C3 p/b Mellow Mushroom). As this large group began to splinter, Wyman and Smith emerged at the front, chasing down Duke. Wyman was the first to make contact and used her power on the flats to put pressure on Duke, while Duke was able to apply the pressure in the technical sections. While the two battled at the front, Andrea Smith continued to press on in the way that has made her a favorite among the fans in New England. 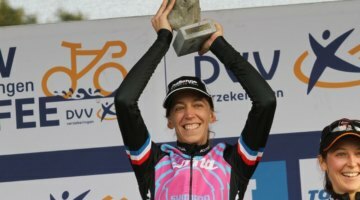 Smith’s tenacious style began to net gains as Wyman found herself briefly tangled in the course tape and Smith made contact with the British Champion. Smith and Wyman continued to press on, putting Duke into difficulty. Duke eventually came off the pace of her companions and, with two to go, Wyman started to attack. Smith, displaying patience and strength, rode within her limits and held as closely as she could to Wyman, stretching her gap behind to Duke. 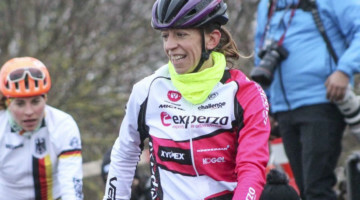 Smith was unable to regain contact with Wyman and the British rider crossed the line first for yet another victory in her American experience. She’s now won eight consecutive races in the US and will hope to make it a perfect trip tomorrow at Gloucester. Smith, for her part, netted a true breakout performance with her second place. Clearly elated at her performance, Smith crossed the line with her hands up as though she had won. 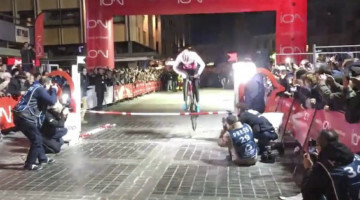 Duke held on and crossed the line third ahead of her teammate Antonneau for third. Gabby Day crossed the line fifth on the day. 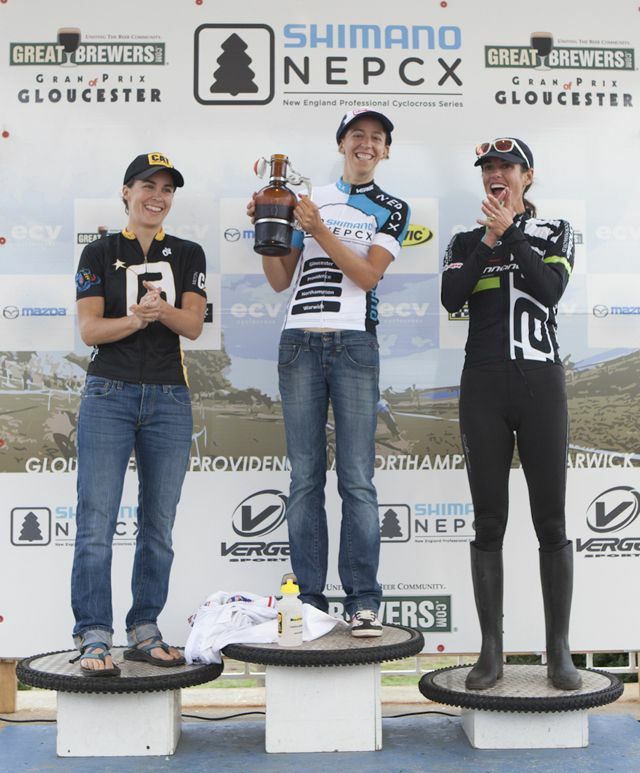 View Cyclocross Magazine’s Gran Prix of Gloucester live coverage page here to see how it went down and watch tomorrow’s racing.